My personal family history is one of emigration for jobs—from Ireland. Members of my family sometimes stopped in Scotland or England before hitting the United States. My grandfather started a business with a horse and wagon—ice, vegetable, and furniture delivery. He graduated to a truck and later become a teamster officer. On my father’s side, there were cops and then nurses and teachers followed. My dad was on a waiting list for 7 years to become a cop. He worked as a tuck pointer, it was dangerous work on tall buildings back then, and when one of his pals fell off a ladder—he quit that job and began looking for something on terra firma. He began working in a shoe factory. He moved on to Ford Motors, where he installed windshields. He was laid off on Christmas Eve. Still waiting for the Chicago Police Department, he took a job as a guard at US Steel. And then, he finally got his patrolman job that he retained for over 30 years. He was at his best on a beat, talking to regular folks about their lives and troubles. On my mom’s side, her parents were born in Ireland and moved to Clyde Bank Scotland for jobs. Her mother, born in Dublin, died just after my mother’s birth. My mom’s father, born in Donegal, was a soldier who fought in the Boer War. He got consumption and died when my mother was six. Her older sisters and brothers looked after her and she came over here on the ship called the Caledonia as a child. It was no coffin ship, but her sisters felt like death—seasick for the duration. Mom loved the trip, but never went back—it was a one-way ticket for her. Her sisters got homesick and they went back to Scotland. One of her brothers raised her here in Chicago. Back in Scotland, one of her sisters married a school master and she would travel again—this time to a Catholic boys’ school in Africa where they worked for a decade. Some of my relatives caught the acting bug and there are a few writers in the group. John S. Norris, my grandfather’s brother wrote a political “potboiler” (or snoozer according to my sister who has a copy) called The Connivers about Chicago politics. My uncle, Jim Divers, wrote a novel that my mother says read like Hotel and Airport, but was lost after he died. My cousin William J. Norris was a Chicago actor and playwright. I have a nephew, Mike Norris, who was in improv. My niece, Marianne Walsh, writes a column for Chicago Parent magazine, blogs on childrearing, and wrote a book called Epic Mom. Tap, tap, tap, the Alderman is at the door. After some small talk, the Alderman got to the point. My dad would lean back and think about his 7-year stretch on the Chicago Police waiting list and then how he needed two jobs to make ends meet. As he looked back at the Alderman, I can only imagine what he wanted to say, but instead he made some innocuous comment that he would see. He would always vote for the mayor, but he kept the alderman guessing. Before things got too cozy for 20th century Americans, there was World War I, The Depression and World War II. Those who reached adulthood during World War II are called the “Greatest Generation.” The 1950s looked pretty bright for many Americans, but it took a little while before the enthusiasm locked in. We had Korea, the Cold War and some fear of nuclear annihilation. But once the baby boom got into full bloom, there was no turning back. By the time the 1960s were here, some had set a course for success, although the 1960s in Chicago were ugly and controversial. The sameness of the 1950s led to a re-invention of values and institutions. And those who had been left out of the “party” wanted in. My family had some miserable times—rarely had a car, almost never had one that ran well. Our tiny house was two steps ahead of the wrecking ball (it was in fact, flattened). Author Frank McCourt and others have suggested that a miserable childhood is the only one worth writing about. When you look back on your miserable childhood, regardless of your roots, you can focus on misery or love. I’ve tried to look at love when I wrote my book, The Brown and White. I am 63 years old sitting in a school bus in front of the Cork and Kerry Pub at 106th and Western Avenue and we are about to go to the 2017 Mount Carmel Alumni Banquet. The banquet is at the school itself in Woodlawn—a few blocks from the future sight of the Barack Obama Presidential Library. Generous alum have built a campus now—including athletic fields, spacious parking, and clean and modern buildings. In my freshman year, we had an old field of crabgrass, a Quonset hut cafeteria, and the old administration building. 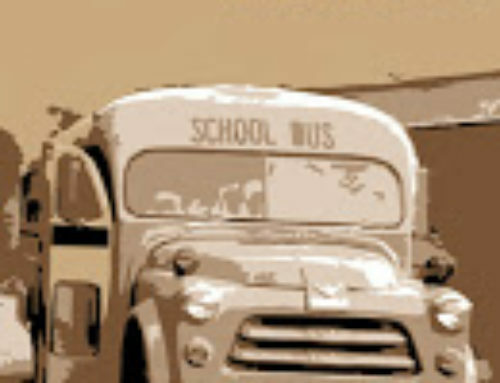 The bus we are taking is a conventional yellow bus unlike the Brown and White “spaceship” (beam me up Scotty) that took us to school in my freshman year in 1967-1968. But today, I am reliving my high school days as this new bus takes me to school once again. But life has changed. Mt. Carmel was a school for the Irish and every other ethnic group in Chicago. Today, it holds more lessons than ever and certainly a powerful mix of kids—an ethnic alchemy going on. As the banquet bus pulls out toward Carmel, we are just a few blocks away from my old pal Hanni’s stop in The Brown and White and at that point in the journey, I would have been surrounded by friends—good company all four years. We would joke about everything and everyone, practice initiation rites having to do with underwear, and look down at girls’ legs in passing in cars. One friend would imitate all the Ed Sullivan acts live on Mondays. Our “sergeant-at-arms” would maintain control by just being himself and our bus driver would teach us Manhood 101. We talked incessantly about our teachers who had huge personalities and offered ready discipline. There is no way you could have scripted a funnier, better, or more complete education for rest of century. In 2017, I don’t know the people on the bus. We are brothers though. Some Carmel grads still say or write “Our Lady of Mount Carmel Pray for Us” at the close a phone call or an email. They have never forgotten the school song. Most everyone still wears the brown scapular. I know, I do. A few weeks before the bus trip, I met with the class of ’65 at the Cork and Kerry. They gave me a written testament to five Carmel grads from their class who had died in Vietnam—a war many of them saw firsthand. The 1965 class was the largest class ever—an eclectic group no doubt. They were interested in my book and I answered many questions. As a fictional work, I used a poetic license here or there, but they want to pencil in the names of the real people. 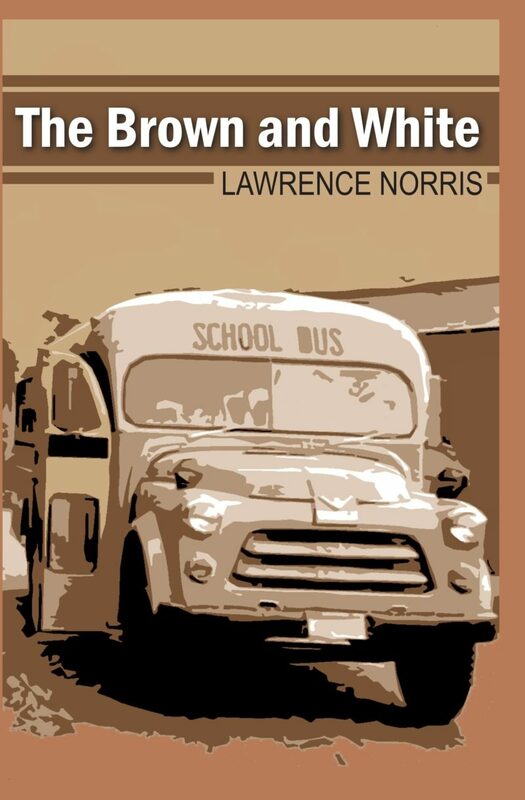 My bus mates will tell you that many of the events in the book did take place, but I wrote the book for the brown and white all over Chicago who went to many different schools. A book can be organic in a sense and it can stir readers’ memories and bring out their own stories. I hope my book does that the way John Powers’ Last Catholic in America and Do Patent Leather Shoes Really Reflect Up did back in the day. But I am also hoping that some director will make a movie from the book. I have my sister out in LA looking for one each time she heads out for dinner. I am thinking Gillian Anderson could play the role of my mother and I could help coach her. Danny DeVito could play Willie the bus driver. It would be a blast, but we would try to keep it tasteful. The southwest side makes me think Irish, especially around the Cork and Kerry and other bars in the area. When the neighborhoods started to change, the Irish bars seemed to multiply, serving as cultural centers and places where neighbors felt at home. But being Irish has never been a requirement for Mount Carmel men. Many nationalities were represented. I couldn’t spell the names of many of the guys I went to school with back in the day—even with two or three tries. 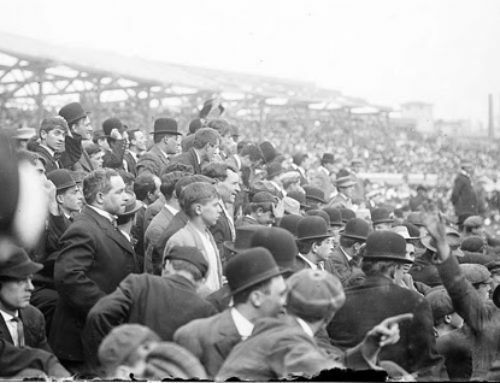 The guys from over east were a mix of Poles, Czechs, Germans, Italians, Swedes, Mexicans, and others. Blacks were coming to school—sometimes from places like Pill Hill and some not so well to do areas. But after King’s death, the brown and white chemistry seemed restricted and troublesome. I am sure it took some time to heal. After I published The Brown and White, I was apprehensive about promoting it to Mt. Carmel. As a small publisher, I had worked on several books for the Catholic market supporting Catholic causes and we often found ourselves at events where the hosting institution was raising money. So when books sales meet a Catholic fundraiser, the fundraiser takes the main road and the book takes the road less traveled. But, a few words got out to Carmel classes from one of my sister’s friends who had Carmel friends from her old parish. My Irish Catholic story of Collin Callaghan (Callaghan was my fraternal granny’s name) started to hit a nerve and within a few weeks I had been on the Skinny and Houli Radio Show. 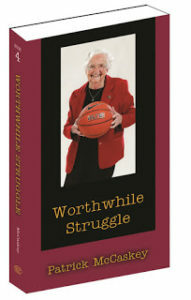 Of course, I heard from people that I should bring the book to the Alumni Banquet. But I said, no, it was Mount Carmel’s dance, not mine. The alumni bus has turned east and I am looking out the window at some “different” neighborhoods. Carmel guys came from all kinds of socio-economic backgrounds in 1967-1968. Integration in Chicago did not go well. Most of the white people moved out of their neighborhoods when blacks moved in. This is still an area of debate when people look back. In Chicago, people loved their neighborhoods, their parishes and their parks. If they moved, they felt like they had to move. Many of the men who moved had fought in World War II, it’s hard to imagine they were cowards. But in Chicago, when things move, they can move fast. As the bus takes a drive down the Dan Ryan and then crosses over on 67th Street towards Mount Carmel, much has changed. It does not look like the same place at all. There are improvement all over. A lot of money has been invested. At the banquet, I get a view of some of the improvements to the school. I hardly recognize the place. The banquet routine is the same—like others I have attended before it was moved to the school. A number of people are being honored, certainly loved and admired by their classmates and alums, but the party goes on pretty much unabated as the speeches roll. That’s a banquet tradition—it about the comradery with classmates, more than the ceremony. Hopefully, the honorees understand it. I talk to my classmates and notice that it’s not quite as lively for them now that they are in their 60s. But the guys who had enthusiasm in freshman year, have enthusiasm now. I myself, run out of things to say, I guess I am a better writer than speaker. A few hours later, I sit back on the bus as the other riders are rounded up. I see some of the current students coming back from a sporting event and they are wearing backpacks, sportswear, and they are working their cell phones. They are not wearing the steeled toe shoes, dark grey or navy Maytag repairman jackets, and one size fits all grey sweatpants that many in our class wore. I put my head back and wonder what it would be like today to cross the city on a CTA bus from the far southwest side all the way east toward the Steel Mills as I did to date my girlfriend back in the late 1960s. I pictured my outfit: a brown beret that my mom had knit, black pants, black shirt and the alligator shoes I got that a Sox baseball player had thrown out. My hair was greased down slightly with Score. I suppose I would look as out of place now, as I did then! Our Lady of Mount Carmel pray for us all, each and every one.